Los Angeles: Performed with Alphonse Mouzon featuring Ernie Watts, followed by Azar Lawrence and Roy McCurdy Mahesh Balasooriya @ the Seabird Jazz Lounge Long Beach Ca. Courtesy of Jeffery Littleton. St. Andrews park Jazz festival with DD McNeil, Kenny Elliot, Ricky Woodard and Sam Hirsh. Performed with Bobby West and Fritz Wise @ the Billy Higgin's World Stage and at the infamous Lighthouse Cafe with Louis Taylor, Theo Saunders and Marvin Smitty Smith. 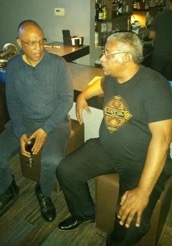 Was nice to spend some cherish moments with the great composer, jazz pianist and four times Grammy Award winner Billy Childs (see picture). Always has been a great inspiration in my life ! New York City: Engagement @ Smalls Greenwich Village with Eric Wyatt, Benito Gonzalez & Jay Sawyer.